Italy will be absent from the World Cup finals for the first time in 60 years after a long night of frustration ended in an ocean of tears in Milan. 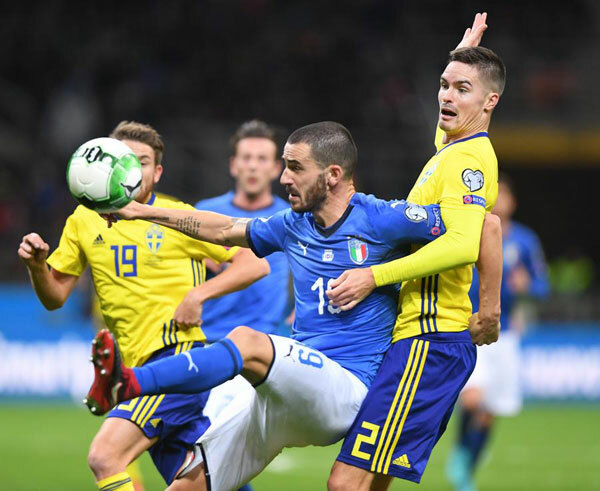 Trailing 1-0 from last Friday’s first leg in Stockholm, they were unable to break down a resolute Sweden who held out magnificently to earn themselves a place in the World Cup draw on Dec 1. There were emotional scenes at the end as the Swedes celebrated one of their greatest achievements in modern times. In stark contrast, the Italian players looked inconsolable, none more so than veteran goalkeeper Gianluigi Buffon, who will retire without the crowning moment of a World Cup swansong. Buffon, 39, said: "It's a shame my last official game coincided with the failure to qualify for the World Cup. "Blame is shared equally between everyone. There can't be scapegoats." Goalkeeper Buffon made 175 appearances for his country in a 20-year career - lifting the World Cup in 2006 - and believes the future could still be bright for the four-time world champions. "There is certainly a future for Italian football because we have pride, ability, determination and after bad tumbles, we always find a way to get back on our feet," he said. "I don't know what we missed, all I know is we're out of the World Cup, it's a unique disappointment and leaving this group of lads is painful," said defender Barzagli. "The era of four or five veterans comes to a close, the one of the hungry young players coming through begins and that's how it should be." Italy manager Giampiero Ventura - under contract until 2020 - did not speak to national television after the defeat but arrived at a news conference 90 minutes after full time. "I have not resigned because I haven't spoken to the president yet," Ventura, 69, said. "I'm sorry for being late, but every player I had the privilege of working with, I wanted to salute individually. "Resignation? I have to evaluate an infinity of issues. We will meet with the federation and discuss it." PREVIOUS：2018 FIFA World Cup Russia NEXT：Meet Zabivaka™, the Official Mascot for the 2018 FIFA World Cup Russia™.